During the spring season Mitchell Lake (the fifth of six impoundments on the Coosa River System), like most Alabama impoundments, can get awfully crowded. As the weather warms and the spawning season gets underway there are hundreds of new anglers visiting this small lake, now over 85 years since impoundment. Every year, not only during the spring season, but year round as well, they come for all over Alabama. Even anglers from throughout the United States plan their fishing vacations, bass tournaments or just fun fishing excursions, to sample some of Mitchell lake’s very fertile waters. 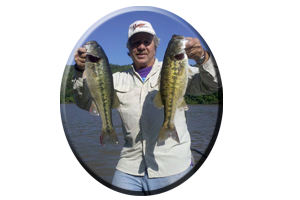 Coosa River spotted bass (some real, trophy-sized spots in the 6-7 pound class) and largemouth bass (up to 10 pounds), are the species they come to Mitchell lake to target. Often, this is the first trip to Mitchell lake for some anglers. They may misjudge the sheer strength of both of these very worthy, adversaries. But, like any well planned fishing trip…getting ready comes first. For the most part, these springtime anglers have been cooped up all winter, anxious and ready to wet a hook (although many anglers fish right through the winter months), some have not even fished for months. So they are very “keyed up” and some anxious anglers just head right to the lake, often unknowingly, very unprepared. A day destined to be headed for disaster, if you have not fished lately or even got your boat out for months! First, comes a little preparation. This means a lot of anglers are preparing the boat getting it ready, like replacing old batteries or at least re-charging all batteries to see if they are still good enough to hold a charge. A bad battery can ruin the start of your fishing day. No matter if its a cranking battery or one or two batteries (some trolling motors now have 3 batteries) that are used for trolling purposes. They may need to be replaced. In today’s bass boats a lot of electronics and an other items can drain the boats batteries on each outing. This takes place after every trip so you must recharge each battery. Constantly re-charging your boats batteries, is what wears them out. Cold, winter seasons can kill a battery fast. Especially if has not been kept fully charged all winter. Organizing all your old tackle boxes and making room and categorizing all your new tackle, can take all day. This includes sharpening all hooks or best yet, replacing all treble hooks on your lures that need it. Check your equipment. Rods may need new eyes, new rod tips or just cleaning up. Reels need servicing or at least oiled, all nuts and screws tightened down or some old reels may just need to be rebuilt or replaced. Check reel handles for wear and replace them if necessary. Always reel-spool all your reels with fresh, new fishing line at the beginning of your spring fishing season. Not that line you had last year, of which has a short shelf life. Try new lines, new types of line, heavier line or lighter line test and make a note of how each line performs with various types of lures. Oh, I could go on. Like checking your boat trailer winch and bumpers, runners and wiring. Especially your boat trailer lights, tires, brakes and most importantly tighten the nuts on the wheels and grease or replace the wheel bearings. Service your outboard motor. Change the oil in the foot of your outboard motor, change to new spark plugs. Even adding a gas additive will help prevent any moisture build- up that may have occurred recently. 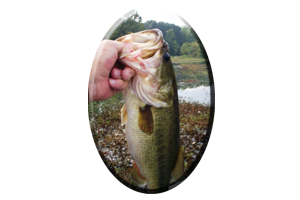 Now, more on Mitchell lake for tackling those pre spawn bass of March, April’s spawning bass and my favorite month May. When, as we all know by now, “its top water time” for those hungry, post spawn bass! Those huge, spotted bass we fooled in the winter months are still there! March is a great time for searching out these places, all within a few miles of Lay lake dam, for numbers of spotted bass in the 1-3 pound range. An occasional one maybe even bigger, like 3-5 pounds. 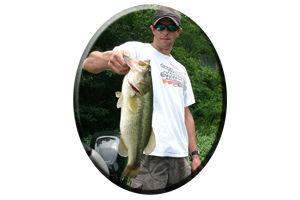 If you are very lucky, you may fool a true, trophy size spotted bass into biting your tempting offering. One that could reveal to be over that magical mark of six pounds! These are rare, with my biggest spotted bass ever fooled on Mitchell Lake coming from these lake headwaters. It weighed 7 pounds and 2 ounces! All of this hinges on you landing the bass. These are huge, spotted bass that will test any anglers patience and his tackle and equipment as well. As a fishing guide on Mitchell lake for over 30 years I have seen many big, spotted bass lost, some right at boat side. Simply taking place by anglers just not prepared for tackling these very strong, current-oriented spotted bass. Besides the aforementioned plan of getting ready, “being ready” is just as important. Always check your reels drag first thing in the morning. Most reels will be frozen and will need the drag adjusted. Not to tight, that can result in broken line, straightened out hooks, a big spot ripping its mouth loose to freedom, or even a broken rod! Of course, your drag must not be set “to loose” as well. Too loose of a reel’s drag will result in not even getting a good hook set or burying the hook, which usually results in lost fish. As Mitchell lake’s headwaters warm into the low-to-mid 60′s, its nearby rocky points leading into smaller pockets, flats with drop-offs nearby and boulder-strewn banks, are all excellent places to target these spotted bass, in your search for these very catchable and fat, pre spawn bass. By the end of March, they make their move to prepare another year’s spawn. This usually takes place on or near the next full moon. At this time many feeder creeks are stained to muddy from recent rain and still, incoming cold fronts plague the lake. This may influence Mitchell lake’s more weed and wood cover oriented, largemouth bass to perk up a little. Or they may become more scarce. But during April and May these largemouth bass can be found to be much more easier to fool. Although there is a lot to be said for the pre spawn bass of March, there is more to be mentioned about fishing in April. Especially for targeting Mitchell lake’s largemouth bass. I did not mention the largemouth bass of March, although the same places you find spotted bass are often occupied by some big, pre spawn largemouth bass as well. Its just that cold fronts, muddy water and still, dead aquatic weeds, always affect the largemouth bass more in March. So, during April many more factors are in their favor. April on Mitchell lake shows new growing weeds and more largemouth bass moving shallow, the closer it gets to the perfect spawning temperature near 72 degrees. Major feeder creeks like Hatchet Creek or nearby Weogufka Creek are all day excursions, in your search for these big, spawning largemouth bass. Both of these creeks feature loads of flats, small cuts and side pockets with weeds, wood cover, rocky habitat and lots of points and flats for finding undisturbed, largemouth bass. As Mitchell lakes various types of new growing aquatic weeds emerge, so do the bass. Most largemouth bass have occupied any wood cover recently. Lay down trees, isolated logs and logjams, stumps or any visible brush may now hold several big, female largemouth bass. All getting ready to mate and make their move shallow nearby in their newly prepared beds. As both the male and female largemouth bass of Mitchell lake begin to make their beds they may occupy some piece of wood cover nearby. They usually prepare their bed very close to some sort of wood or rock cover. If new growing weeds are beginning to emerge as they prepare these beds, it only enhances these bedding spots. Aquatic weed growth increases the oxygen level. This is very evident as you can actually observe the clearing of the water surrounding new growing weeds, immediately following heavy rain in stained to muddy water situations. Weeds also provide great ambush spots for big bass laying in wait for any potential meal passing by. Then again, these weeds also hide the many types of smaller prey from bigger predators, like the largemouth bass. As Mitchell lake’s flats and back waters warm more and more with each passing day in April, the activity becomes evident as well. All within and all around any of these green, newly- growing aquatic weeds, prey begin to occupy the security of these oxygen-rich weeds…and the bass seem to know it, with their evident explosions within the weeds. These largemouth bass are big and its not easy hiding a two foot long body from these very quick and agile prey. So the thicker the weeds and the more wood cover they have to relate to, the better hidden they feel and the more secure a big bass is for stealth and ambush purposes. Largemouth bass linger by these weeds all day long at times. They can occupy thick, matted weeds if its a bright and sunny day. Or cruise the weed edges at night, early morning, late evenings (or all day if raining or very cloudy), during low light periods. So keep in mind. Always return to places “they were not in”, or places “they just were not active in” you fished early in the day. To have a better chance at fooling these often weary bass of Mitchell lake in spring. Bass moving in spawning areas or even bass that become more active with daytime sunlight often warming the water 4-5 degrees. In addition, mid mornings to late evenings during the month of April, often show bass that are undisturbed when other boats leave an area…all for you to explore in silence. By around the first week May, the majority of Mitchell lake’s bass will have spawned. Most are through bedding and getting ready for summer. You may ponder, “how does he know that”? Well, its no secret that some of Mitchell lakes bass do spawn later in the spring season than other bass, for some reason. Maybe they live on the lakes mid-to-lower end. On Mitchell, this is where some of the lakes deeper water is and its usually the last water to cool lake wide, to a more comfortable 72 degrees. 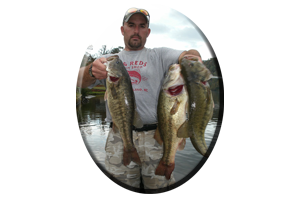 One very evident factor anglers can look for, to determine if a bass has already bed, is searching for small fry bass. They are usually visible when you use polarized sunglass and cruise the shallows in clear water situations. Small fry bass ball up in a small, dark mass, usually about the size of soft ball. Or bigger. If a lot of newborn balls of fry are evident, its a sure fact most bass have bed in any given area. What’s good about this is, small defensive male bass are always nearby and often, a big female bass may not be to far away. They are there and always ready to attack your lures with a vengeance, in an attempt to protect the newborn fry. How else can you tell if these bass have already bed? If you see a lot of beds along flats, around weeds, or up in some very shallow backwater area, look for those beds that display a dull looking color. These are abandoned, silted-in beds, that help you determine if these bass have given up house keeping. Most of Mitchell lake’s largemouth bass will keep a bed clean, fanned-out, and free of any debris. They will run off all intruders, until the eggs hatch, and the newborn fry grow to about one inch in length. This is when both of the parents of these 10,000 (or more), newborn bass and their surviving, newborn offspring will abandon the bed. Of this many newborn bass, over half will not make it, due to predators during the spawning season. On the other hand, if you are searching for bedding bass on Mitchell Lake its true they can be identified by observing if they have a bloody tail or wore-off tail. This means both the male and female bass are still fanning or preparing their beds. Bedding bass (bass actually on the bed) will hover over a rounded out, brightly colored bed. Or they can rest along weed lines and wood cover near the bed. They will also look like they are in a trance and at times they will completely ignore every lure you throw at them. Fat, healthy bass, with healed up tails, are usually in a post spawn mode by late May and around the first week of June, the beginning of summer.